In physics and chemistry, melting is the process of converting a solid substance to its liquid form, typically by heating the substance to a temperature called its melting point. In the reverse process, called freezing, the liquid substance is cooled to the temperature called the freezing point, when it changes to the solid form. The melting point and freezing point are usually the same temperature. The melting or freezing of a substance is known as a phase change or phase transition. Chemically, the substance remains the same, but its physical state (or "phase") changes. Unlike the boiling point of a substance, its melting point is relatively insensitive to pressure. Our knowledge of melting and freezing can be applied in various ways. For instance, the purity of many solid compounds can be determined by checking their melting points. Also, freezing is a familiar method of preserving food. Melting a solid, such as a metal or plastic piece, is an extremely valuable means of molding it into a desired shape. The preparation of alloys involves the combining of metals after they have been melted. Given a mixture of several substances in the solid state, melting is a way by which some of these substances can be separated from others (with higher melting points). Materials with high melting points are valuable for making products that need to resist high heat. In most cases, the melting point of a substance is equal to its freezing point. For example, the melting point and freezing point of the element mercury is 234.32 Kelvin (K) (−38.83 °C or −37.89 °F). Some substances, by contrast, possess differing solid-liquid transition temperatures. For example, agar melts at 85 °C (185 °F) and solidifies from 32 °C to 40 °C (89.6 °F to 104 °F)—this process is known as "hysteresis." Certain materials, such as glass, may harden without crystallizing; these are called "amorphous" solids. The melting point of water at 1 atmosphere pressure is 0 °C (32 °F, 273.15 K), also known as the ice point. In the presence of nucleating agents such as dust particles, the freezing point of water is the same as the melting point. On the other hand, in the absence of such agents, water can be supercooled to −42 °C (−43.6 °F, 231 K) before it freezes. As nucleating agents are commonly present in the environment, rainwater and tap water normally freeze at (or close to) the melting point of pure water. Also, if a substance is rapidly cooled by sudden exposure to cryogenic (extremely low) temperatures, it will freeze below its melting point. This process is known as "flash freezing." If a substance contains a small amount of impurity, its melting point (and freezing point) becomes lower than that of the pure substance. The greater the amount of impurity present, the lower the melting point. Eventually, at a certain composition of the mixture, a minimum melting point will be reached. At that stage, the mixture is said to be at its "eutectic point," or it is called a "eutectic mixture." The chemical element with the highest melting point is tungsten, at 3,695 K (3,422 °C; 6,192 °F). Carbon does not melt at ambient pressure, but it sublimes (goes from the solid state directly to the gaseous state) at about 4,000 K. A liquid phase exists only above pressures of 10 megapascals (MPa) and an estimated temperature of 4,300–4,700 K.
Tantalum hafnium carbide (Ta4HfC5) is a refractory compound with a very high melting point of 4,488 K (4,215 °C, 7,619 °F). At the other extreme, helium does not freeze at all at normal pressure, even at temperatures infinitesimally close to absolute zero (0 K). Pressures that are over 20 times the normal atmospheric pressure are necessary for it to freeze. If a solid substance is heated, its temperature will rise until it reaches its melting point. If additional heat is supplied, the substance starts melting, and the temperature remains the same until the material is entirely melted. The amount of heat absorbed by 1 gram of a substance at its melting point when changing from the solid state to the liquid state is called the latent heat of fusion or the enthalpy of fusion (symbol: ). For example, the latent heat of fusion of ice is approximately 80 calories per gram. 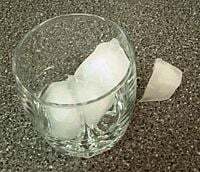 This means that 1 gram of ice at its melting temperature (0 °C) will absorb 80 calories of heat before it melts completely. For the reverse process, when 1 gram of the same substance in the liquid state is frozen to its solid state, it releases the same amount of heat. Melting points are often used to characterize compounds and ascertain their purity. Freezing is a common method of food preservation, because it slows food decay and the growth of microorganisms. In addition, by turning water to ice, it makes the water unavailable for bacterial growth and chemical reactions. Given that ice has a relatively high latent heat of fusion (noted above), it is useful for refrigeration—that is, for cooling items that are warm and maintaining them at a low temperature. Melting a solid is an extremely valuable means of reshaping the solid. This is often done when metals and plastics are molded into new shapes. If one has a mixture of several solid substances, melting is a way by which some substances (with lower melting points) can be separated from others (with higher melting points). The preparation of alloys involves the melting of metals, combining them when they are in the molten state, and then allowing them to solidify. Materials with high melting points are valuable for making products that need to resist high heat. For example, tungsten, with its extremely high melting point, is used in filaments for light bulbs. In genetics, the melting of DNA means the separation of double-stranded DNA into two single strands by heating or the action of chemicals. In biology, freezing is the reaction of an animal to a fear-eliciting situation, enabling it to remain undetected by a predator and prepare a fight-or-flight reaction. The heat of fusion of water is 79.72 calories per gram, or 334.5 joules per gram. The heat of fusion of some other common substances are given in the table below. Source: CRC Handbook of Chemistry and Physics, 62nd edition. ↑ A nucleating agent for freezing or crystallization is something that provides tiny "nuclei" (such as dust particles or minute crystals) that promote the onset of the phase transition process. Kleinert, Hagen. Gauge Fields in Condensed Matter, Vol. II, "Stresses and Defects; Differential Geometry, Crystal Melting", pp. 743-1456. Singapore: World Scientific, 1989. ISBN 9971502100. online. Retrieved October 13, 2014. This page was last modified on 13 October 2014, at 21:17.